Our 100% natural cocoa is dried from the finest quality cacao beans. 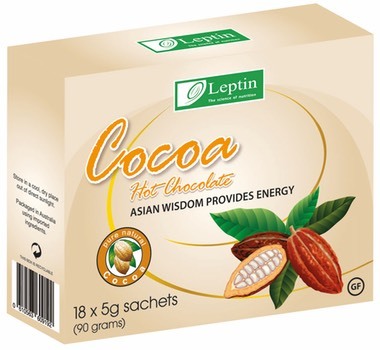 The anti-oxidant ingredients in Leptin Cacao scavenge free radicals & can assist in protecting the cells in the body against oxidative damage. This formulation contains nutrients that are involved in the production of energy in the body & supports daily energy requirements & mental & physical performance. It has tonic & nutritive actions on the adrenal glands which means Cacao is beneficial during times of stress. Cacao also supports healthy functioning of the immune system, supports metabolism, contributes to the maintenance of healthy skin & general wellbeing. DIRECTIONS: Take one sachet with 180ml boiled water. CONTENTS: 18 sachets x 5grams each, 90grams net weight. WARNING/S:Vitamin supplements should not replace a balanced diet. If symptoms persist, consult your healthcare practitioner.Contains sugars. The recommended dose of this medicine provides small amounts of caffeine.